A glut at the bottom, but soaring prices for rarities! This past week, I received two very very different sets of photos from two collections of cobalt blue glass. One of these sets of photos was sent to me by a friend who was helping an elderly woman dispose of her estate. The other one was a notification from an online auction by the foremost auctioneer of antique bottles and glass in the country, Norm Heckler and Co. of Woodstock Valley, Connecticut. The photos of cobalt glass that my friend sent me to appraise for him were almost identical to so many other collections I have seen over the past ten years. The situation usually is that back in the 1970s, the woman of the household jumped on board with one of the hottest trends in home decorating of the day: dark cobalt blue glass bottles and whimseys. When the decorating trend began to fade, many of these items wound up packed away in boxes in the attics and crawl spaces of the homes of these folks from the baby boomer generation. As years passed, they logically assumed that these collectibles would gain in value, since many were antiques back in the 70s when they were purchased. Generally, I have to break the bad news to them. The most often seen old bottles in these collections usually include vintage “Phillips Milk of Magnesia” and “Bromo Seltzer” bottles. Some of these were machine made in the 1920s-50s, and some were turn of the century with hand tooled lips. Thirty years ago, I used to sell these at bottle shows and flea markets and get $5 a piece for them, which is about what they sell for today. I dug the bottle on the left out of an old trash pit last fall. It dates to the 1890s, though it looks very new when it is cleaned up. It’s valued at about $40.00, but there can be other sizes and variants that can be worth hundreds! The other two items in the photo, which I dug the same day, include two “slag glass” items. One is a limousine bud vase, which sat in the armrest of limousines many years ago. The other is a gear shift knob, from an old “rat rod” racing car. Took me forever to research this oddity, just to figure out what it was! Also in these collections are random machine made cobalt blue decoratives that would have been picked up at Pier One Imports type gift shops over the years, and they are what they are. Right now, cobalt blue glass isn’t what you would call a current decorating trend. They are simply used as color contrasts with what is currently popular. However, these things do tend to go in cycles. It is, however, worth having the collection looked over by someone who knows antiques and early glass because it is logically possible for a valuable piece to have made its way into the collection. 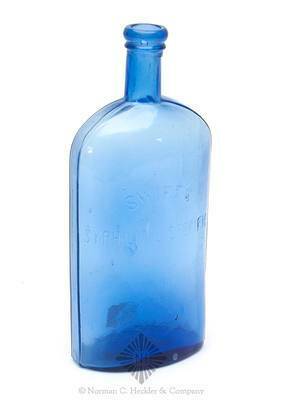 Cobalt blue bottles embossed “POISON” on them anywhere are the easiest thing to keep your eye out for. Almost any of them will be original (not repros) and will have value. If you ever see a cobalt blue skull-shaped bottle, with the word POISON embossed on the base, leap on it like a wild animal, and wrap your arms around it. 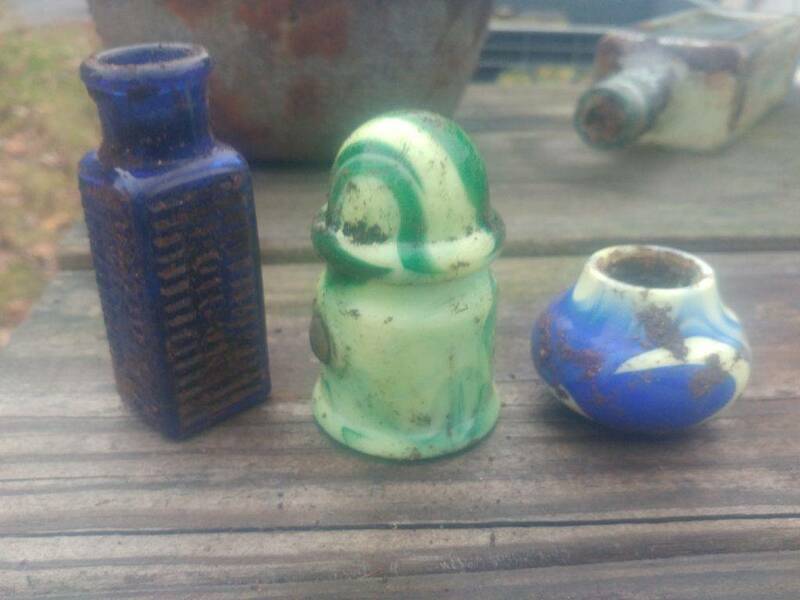 What you have found (hopefully) is a rare and extremely popular poison bottle made in Boston in the 1880s or so, which comes in three sizes, and if it’s not damaged, has a value of between $1,500 and $4,000! 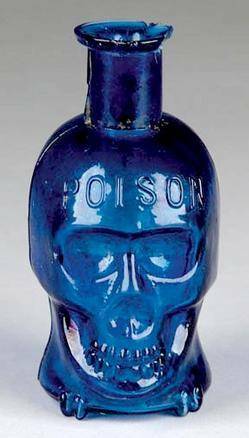 These rare and very popular cobalt blue skull shaped poison bottles are an iconic bottle in the field of bottle collecting. They were made just before the turn of the century, and range in value between $1,500 and $4,000, depending on the size and condition! So going back to my story, the other set of photos I got on the same day via email, was from the famous Norm Heckler Auction Co. They had just completed an online auction that featured the best of the best, in cobalt blue glass. Most of the items in this auction are very, very rare, and the chances of one of them winding up in someone’s old collection of casual decoratives that were stored away in the attic, while not impossible, would be extremely unlikely. 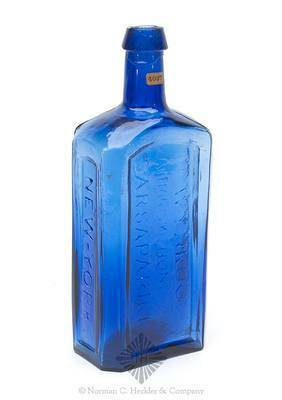 This amazing auction was mostly consigned from one collector who hunted down the very best examples of the rarest cobalt blue bottles, flasks, open salts, whimseys, and other cobalt glass items of the past 200 years or so. Here below are some of the highlights from the Heckler Auction. 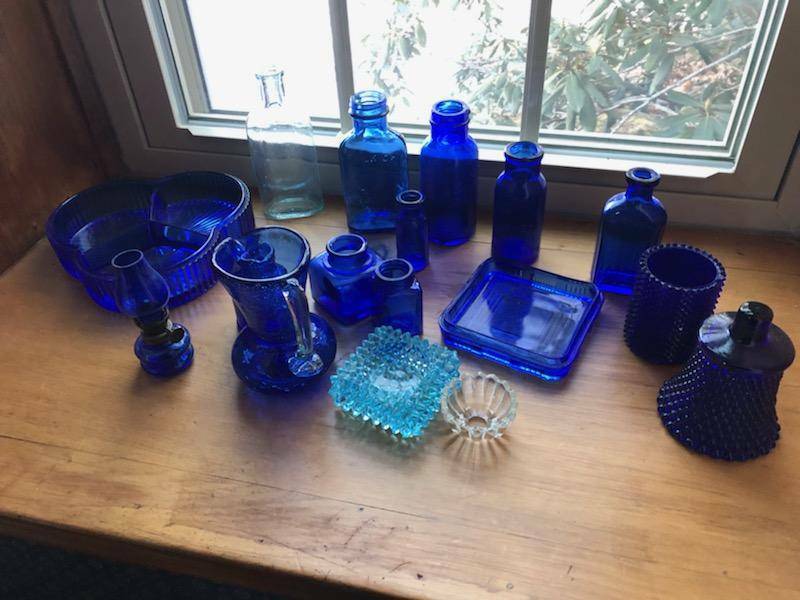 And though I would keep my expectations low while unpacking Gramma’s “old blue glass collection,” I wish you the best of luck with it. Maybe, just maybe, somehow, you’ll find a rare treasure like one of these packed at the bottom of a box! 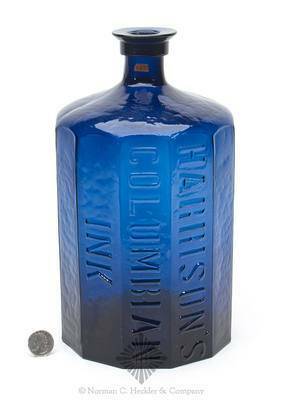 Harrison’s Columbian Ink sold for $19,890. Dr. Wynkoop’s Katharismic Honduras Sarsaparilla sold for $8,190. Swift’s Syphilitic Specific sold for $644. Bram Hepburn collects 19th-century New England bottles and glass, having spent the last 30 years digging and diving for bottles in New England and upstate New York. He has just founded an estate liquidation company and auction house, Hepburn and Co. Antiques in Eliot, Maine. You can send an email to him at askus@hepburnandcoantiques.com.